The Quantum Ghost is the second book in Jonathan Ballagh's excellent Quantum Worlds series aimed towards the middle-grade or young adult reader. 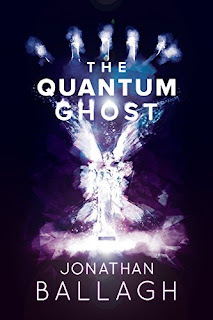 Although not necessary to have read book one, The Quantum Door, it would help establish characters who appear in both. Having said that, this book works equally well as a stand-alone novel. I'm in the fortunate position of having read both due to the author approaching me for reviews. Putting myself in the mindset of a much younger 'me', this is exactly the sort of book I would've devoured with immense pleasure had it been available 35+ years ago. The characters are extremely well-written, original and fully fleshed out; Remi being a prime example - she's intelligent, super-loyal, dependable, empathetic and full of spirit. In this second book we once again meet familiar characters including Nova and mechanical dog Achilles, although they feature less prominently this time around. It's fundamentally a story about Good versus Evil in a failing, parallel universe. Each chapter is action-packed and the pacing is thrilling. I often find a second or third book in a series can be a let-down, but not with this one. I enjoyed it even more than the first. I did have one teeny-weeny gripe though - Remi appeared to complete her adventure without stopping for food even once lol! If you have kids who love sci-fi, you could do far worse than introduce them to the writings of this capable author. Me? I have my fingers tightly crossed the series continues into book three. My thanks to author Jonathan Ballagh for providing a copy of this book. On a cold autumn night, twelve-year-old Remi Cobb makes a startling discovery—a mysterious object floating on the pond in her backyard. With no idea where it came from, or how it got there, Remi is compelled to unravel its secrets. Her quest for answers takes her on a perilous journey across realities, where she finds a crumbling world—and the dark forces behind its ruin. Here she learns the truth about her connection with the strange object, and of those that will stop at nothing to destroy them both. But even if she can find a way to survive, can she find a way home?